The holiday season is here and with that comes many things! Family and friends are gathering everywhere for those much needed winter catch ups and celebrations. The streets are filled with pretty lights and the stores have an abundance of things for us to buy. I’m not a huge fan of the winter, everyone who knows me knows that i’m a summer baby in every sense! I will say this though, I enjoy watching great movies this team of year, partaking in fun events and parties and of course pampering myself! Some like to snuggle up on the sofa in a new pair of PJs, others enjoy a glass of mulled wine or a hot chocolate. Now don’t get me wrong I enjoy these things as much as the next girl but for me, there’s no better feeling than a piping hot bubble bath with luscious essential oils and pretty colours. A couple of years ago a friend of mine introduced me to the incredible brand Lush! I absolutely see why they named the company this because their products are just to die for! All of their products are vegetarian and handmade each with it’s own significant features, benefits and amazing scent. Lush are an Eco friendly, animal loving, fun and fresh company and; I have become what one could an addict! Their bath bombs are my favourite thing to buy as they make the bath time experience so much more enjoyable. Forget your typical bubble bath, Lush bath bombs are a small package of essential oils, beautiful colours and even glitter at times! I find that your skin is left feeling baby soft, beautifully fragrant, vibrant and revitalised. I even know of some parents using these as a way of getting the kids into the tub! They even have a play-dough style product called Fun which is perfect for the kids to enjoy during bath time and, this can be used as a shampoo or creamy bubble bar. During the winter season Lush have a selection of seasonal specific items which are sold between October and December and unfortunately for me, my favourite scents come in this collection so I have to stock up! 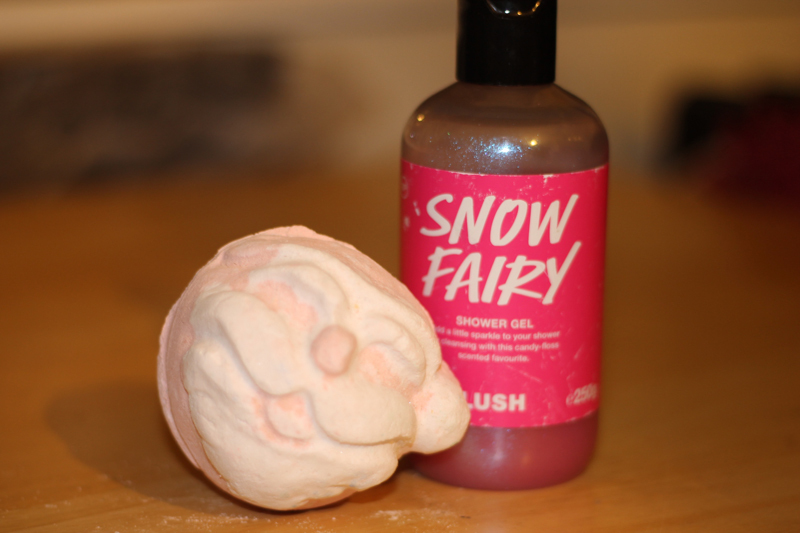 Snow Fairy is the most incredible candy floss scented shower gel that comes in unicorn pink, with a little glitter that produces the most silky soft lather. I have been buying this gel every Christmas since I have become a Lush customer, I simply can’t get enough of it lol! I recently bought a bottle of this with the Father Christmas bath bomb. This one carries the face of Santa that bursts in a snowy white foam with Christmas red explosion, eventually turning into an emerald green lap of luxurious water. Using these 2 items together is something I highly recommend! 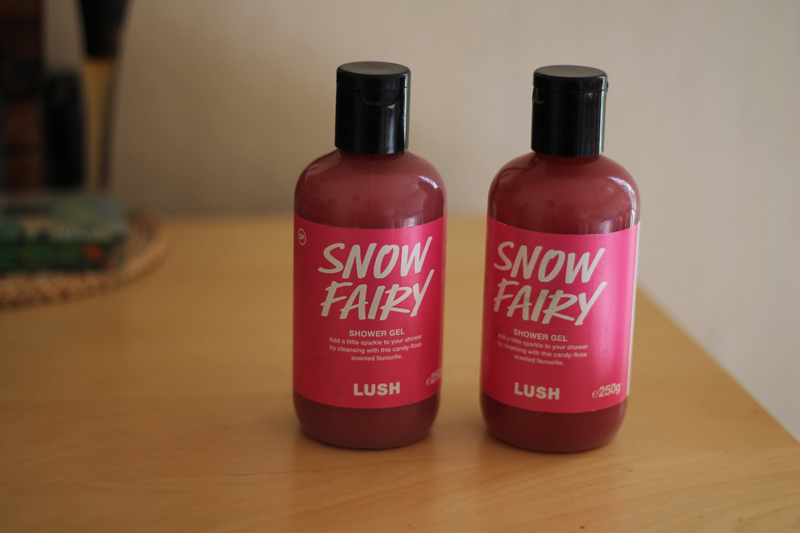 During my most recent trip to the Oxford Street branch I stocked up on a few bottles of Snow Fairy, picked up a collection of amazing bath bombs and some much needed moisturisers. This time of year Lush have an incredible selection of Christmas gift sets, great items for both the hair and body and in some of their locations an incredible spa! Gentleman your women will love you that little bit more if they are treated to a really luscious way to have a home spa session! It’s worth checking out the range as you may even find something you like too! The team over at Lush are super friendly and fun people and they make shopping there such a great experience! I have to take my hat off to Lush for finding and employing so many amazing people! I will also say, there have been many times I have wanted something specific for a target area of the body such as the perfect cream for softening the feet. I was given the most amazing product to sample, Pink Peppermint Foot Lotion and I have to say I was amazed at the results, and of course the amazing minty fragrance. The team are incredible at recommending products and you get to try them in the store before you buy! If you’re looking for something amazing this Christmas for yourself or as a gift do try out their range! You won’t be disappointed! Kitty they are amazing!! Trust me, the keep they packing and stuff pretty simple but I like that as the products really speak for themselves! The foot lotion is incredible, you literally see results after one use!